Regards from us to your 2019 version! Is it a better, healthier, more stable and successful one? We hope so! That’s where Wikitude is heading as well and we already took the first steps of 2019 in this direction. Throughout 2018 we launched several updates, and now we’re bringing you a new feature which is a definite sign of growth, both literally and figuratively: Extension of Object Targets. This, alongside significant process improvements, are the result of learnings drawn from internal testing and feedback we received from our users. Target Manager: targets are the real-life elements (2D or 3D) on which you can display digital augmentations. The Manager functionality allows you to create Image (2D) and Object (3D) Targets, to check the quality of Image Targets as well as share them to the cloud, and to export your projects to embed them in your app. Studio Editor: here you can visualize your targets in detail, edit them, quickly add augmentations and test. Moreover, without any coding knowledge, you can preview the AR experience and publish it to the Wikitude app. This new feature can improve tracking and recognition of 3D objects and scenes, by allowing you to extend an Object Target with additional images after its initial creation. The workflow is simple: you create an Object Target by uploading a few pictures of your object. 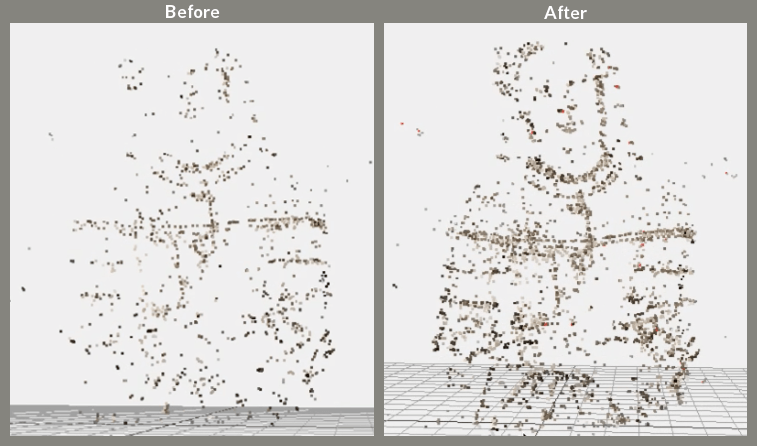 Based on your images a point cloud is created which you can view in Studio Editor. You may notice that some parts of your object are not well-represented in the point cloud, which could, in turn, affect your target’s tracking and recognition quality. To improve tracking and recognition, you can now extend your target by adding more pictures of the same object. This will cover new areas and add details to the ones which were not well mapped before. Make sure that you choose images which have some overlaps with the images you’ve selected for the initial creation. *Please keep in mind that this function will only work with projects created from now on and older Object Targets cannot be extended. On the process level, we fine-tuned two aspects which lead, according to internal tests, to substantial results: an improvement of 20% in location accuracy as well as being able to recognize and track the object in the camera view in 20% more situations than before. Firstly, our algorithms were adjusted to map more pictures and in more cases. Therefore, images that can not be used are a lot rarer now and there is a higher probability that the majority of source pictures can be used in generating the Object Target. Secondly, the mapping process itself was modified to prioritize the order in which we process pictures based on their accuracy. This leads to more robust Object Targets and better control over difficult photos. Read more Wikitude Studio related news in the previous Wikitude Studio release blog post. If you haven’t yet, now there’s one more reason to try the Object and Scene Recognition feature. Sign up today to try Wikitude SDK and Studio Editor for free.